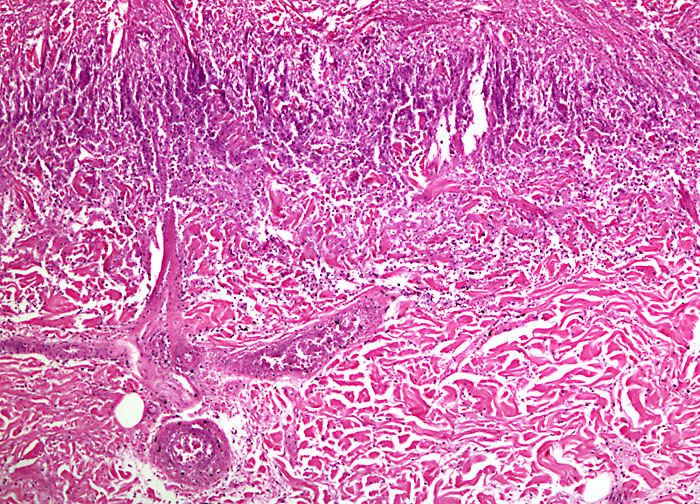 Third-degree burns are typically considered those that involve the destruction of the entire thickness of the skin, penetrating the epidermis and dermis as well as the structures located within these layers, including the blood vessels, hair follicles, sweat glands, and sebaceous glands. Since pain receptors are also destroyed by third-degree burns, this type of injury is often initially less painful than a first- or second-degree burn, and may simply seem numb to the burn victim. If pain is experienced by the patient, it is generally due to nearby areas that may have only received second-degree burns. The appearance of third-degree burns is usually leathery, but the color may vary from white or tan to brown, black, or red. Charring and coagulated blood vessels are also often observable with this type of burn, and signs of shock are not uncommon.